On September 28, the company will hold a press event in New York City, where it'll likely announce a tablet that's smaller but also much cheaper than Apple's iPad. 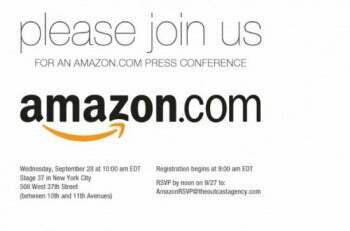 Although the invitation doesn't say what Amazon will be talking about, the company rarely holds press events for anything other than new Kindle hardware. With the New York gathering, the announcement could herald something bigger than just an e-reader announcement. Amazon held only one-on-one briefings with press for last's year's more pedestrian Kindle third-generation update. Earlier this month, TechCrunch's MG Siegler wrote a hands-on preview of what was supposedly a pre-release version of the Amazon tablet. It had a 7-inch display and ran a heavily modified version of Android that emphasized apps, movies, TV shows, books, and music from Amazon's digital stores. The tablet did not include the Android Market or any Google apps. Siegler also reported that the tablet's name is simply the "Amazon Kindle," suggesting that Amazon's older E-Ink readers will fade from the spotlight. At a price of around $250, it'll compete with Barnes & Noble's Nook Color, but it could also take business away from the iPad due to its multimedia capabilities. But even Siegler wasn't allowed to publish pictures of the tablet hardware, so Amazon still has plenty to show next week. Also a mystery is whether Amazon's E-Ink Kindles will get an upgrade, or simply take the backseat to the new tablet. The press conference starts at 10 a.m. Eastern time, so stay tuned.